Does the Boko Haram Insurgency Stem from Environmental Degradation and Climate Change? Instability in Nigeria … has been growing steadily over the last decade — and one reason is climate change. In 2009, a UK Department for International Development (Dfid) study warned that climate change could contribute to increasing resource shortages in the country due to land scarcity from desertification, water shortages, and mounting crop failures. Again, links to climate change can be more or less strong. A case in point is Nigeria’s frequent farmer-herder conflicts. In a pattern seen across the Sahel since the thirty-year drought, feed and water shortages caused partly by desertification and drought have sent nomadic pastoralists, most of them ethnic Fulanis, wandering south, outside their normal grazing routes. At the same time, a mix of weather-related factors has pushed farmers to cultivate more land each year, leaving wanderers fewer places to water and graze their stock. The resulting contests may have been responsible for the deaths of several hundred Nigerians since the return of democracy in 1999. Regardless of such dismissive rhetoric, climatic fluctuations have likely played a significant role in producing political instability not only in northeastern Nigeria but across much of the rest of the Sahel belt (the area south of the Sahara). Most of this region experienced a series of devastating droughts during the late 20th century and into the early years of the new millennium. The desiccation of Lake Chad has been an environmental disaster of almost the same magnitude as that of the Aral Sea, although it has received far less media attention. 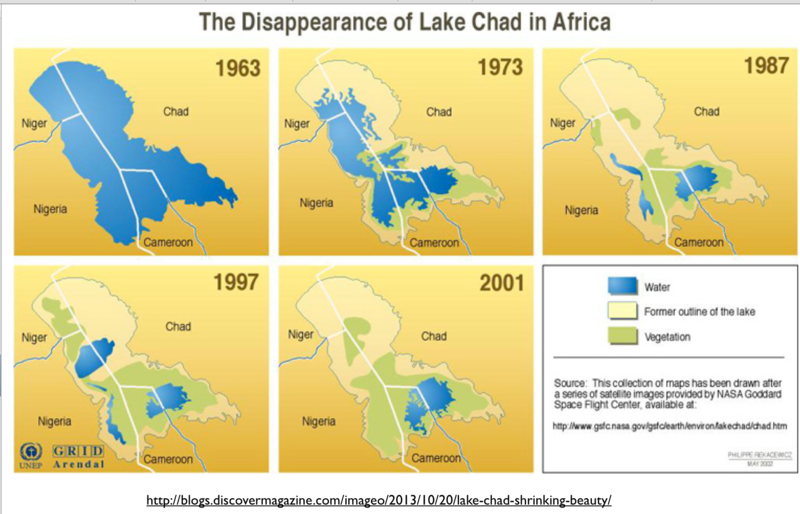 Lake Chad, not coincidently, sits at the core of the Kanuri area, the ethnic group most closely associated with the Boko Haram insurgency. The Sahel remains one of the poorest and least developed regions in the world. It’s also one of the most vulnerable to climate change and variability. 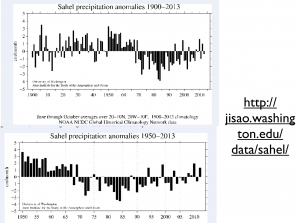 One bright spot for the region is that since the mid-1980s, average rainfall has increased steadily [see this animation]. People engaged in sustainable land management techniques such as agroforestry have been able to take advantage of it, rebuilding their livelihoods. 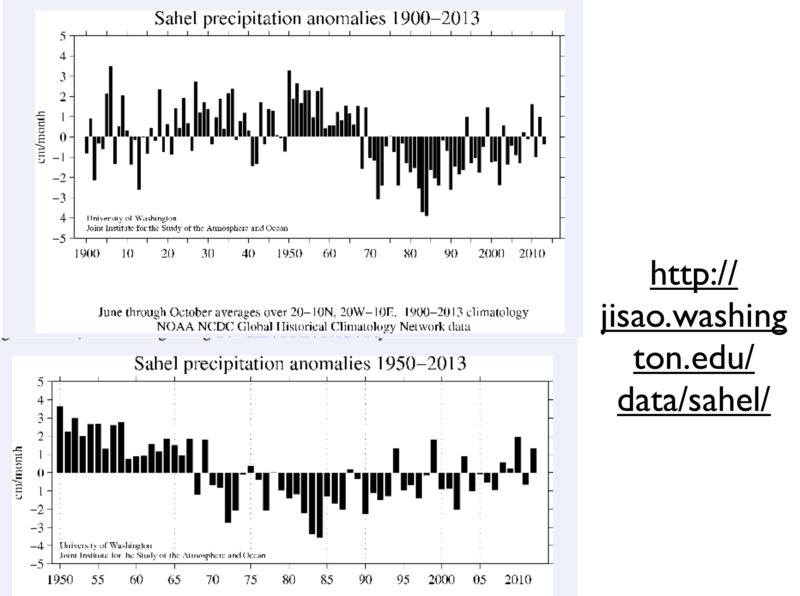 This is markedly different than the wetter Sahel of the 1940s and 1950s, before the droughts. Back then, the higher rainfall came from more frequent rain events. But it is consistent with the general expectation from climate change that a warmer, moister atmosphere may lead to more intense downpours. The increase in rainfall doesn’t necessarily bring only good news for the people of the region, however. The more intense downpours have led to recurrent flooding in recent years, causing loss of life, crops and infrastructure. 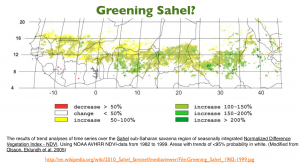 Several studies [have focused on] on long-term environmental and agricultural change in the Sahel (in Niger, Nigeria, Burkina Faso and Senegal). These studies have found evidence of significant transitions from degradational land use trajectories to more sustainable and productive production systems. These include increases in cereal yields, higher densities of trees, improved soil fertility management, locally higher groundwater tables, reductions in rural poverty, and decreased outmigration. The overall situation is of course quite complex, with tremendous local variability. But that said, it does seem that arguments blaming political violence in northeastern Nigeria on human-caused climate change and its associated environmental degradation should be regarded with some skepticism. The idea that resource scarcity is the ultimate font of Boko Haram is equally problematic. On first glance, this linkage seems reasonable. 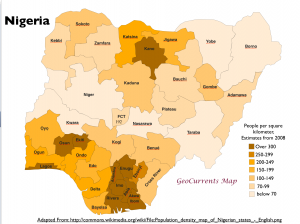 In poor countries and especially under regimes of subsistence economics, resource scarcity is often closely linked to population pressure, and Nigeria has a very large population indeed. 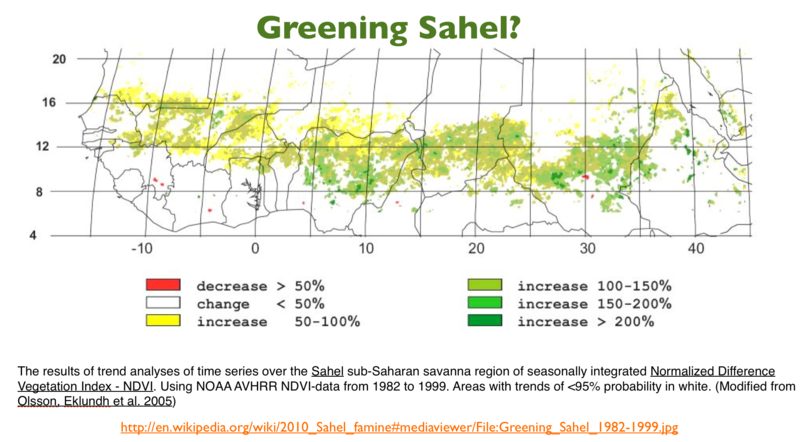 Much of northern Nigeria is densely settled, much more so that the rest of the Sahel belt. But at the more localized level, the connection breaks down. 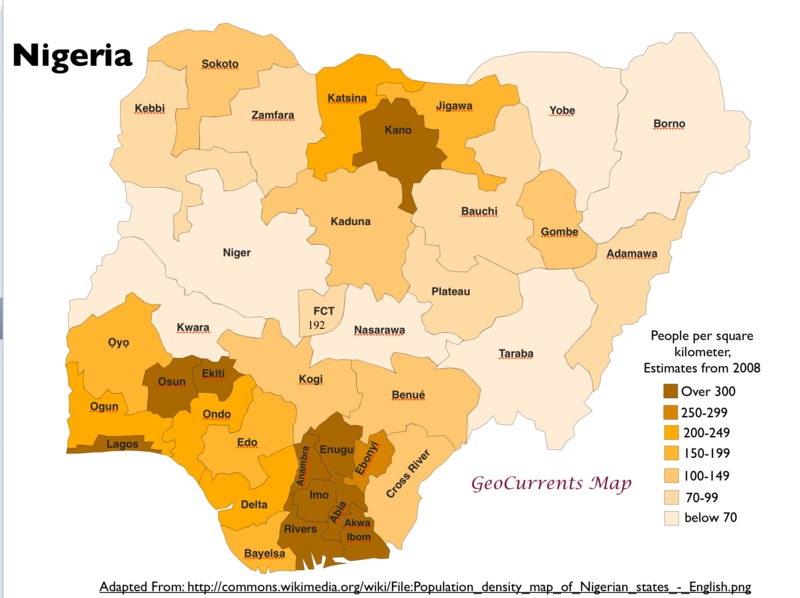 As we can see on the map posted here, central-northern Nigeria is very crowded, but the northeast is not. The Nigerian states that have suffered the highest levels of violence from Boko Haram are actually sparsely populated by Nigerian standards.